In today’s digitally driven world, the success of a business is increasingly tied to its ability to extract value from data. Exploiting the untapped value of your data is now the pathway to success. By putting data-driven decision making at the heart of the business, your organization can harness a wealth of information to gain an unparalleled competitive advantage. In a future-ready enterprise, you must make a fundamental shift from a focus on technology to a strategic business focus. Data-driven insights can guide everything from the formulation of top-level corporate strategies to connected devices that monitor and enable immediate critical decisions, to the creation of personalized customer interactions. Data is the foundation for enabling business transformation and innovation. 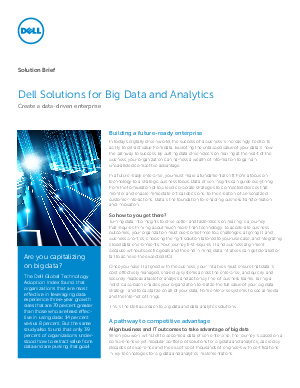 Download this whitepaper to learn how Dell can help you realize the full value of your big data strategy—and to capitalize on all of your data, from enterprise systems to social media and the Internet of things.